Keep project notes together in one convenient, portable notebook. Great for class notes, assignment details and more. Features clear view cover. 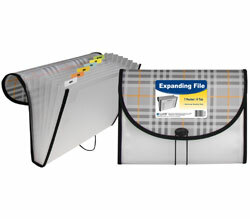 Includes three repositionable, tabbed poly dividers and 60 ruled, perforated 3 x 5 index cards. Assorted colors include blue, purple, pink. Minimum purchase quantity is 24 units (one display).